The song A Flower Is a Lovesome Thing was written in 1941 and first performed by Ellington during a radio broadcast on June 1, 1946. 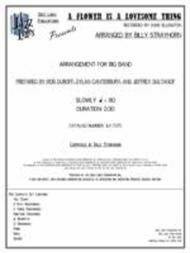 The arrangement published here is an all-out alto saxophone feature and has been derived from an incomplete set of parts, a lead sheet, and a condensed score. Most of this arrangement was cut for the 1946 performance and subsequent performances from that same year as well as those from 1947. For this publication Strayhorn's original arrangement has been completely restored.